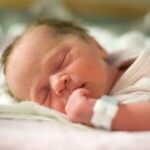 can premature babies survive born at 22 weeks gestation ? in general premature babies are classed as viable at 24 weeks gestation. as new technology is discovered and new methods to keep premature babies stable are invented will babies be viable from the 12 week of pregnancy in the future ? only time will tell. In the meantime what if a baby is born at 22 weeks of pregnancy ? do these babies survive ? what do doctors do at delivery ? do they attempt to resuscitate a baby born this early ? do they intervene to help them breath with machines such as a ventilator or cpap? lets take a further look. In the uk hospitals vary from one to the next some start to save babies at 23 weeks others 24 weeks. Babies can survive at 22 weeks yes the risks are high as yet, due to the delicate veins arteries in their tiny bodies they can suffer from brain bleeds stage 1 -4 and other life threatening conditions such as infections nec and other issues but in most instances mums and dads want you to fight for their babies to at least give them a chance to live. what weight will a premature baby born around 22 weeks be ? a premature baby could weight 1lb in weight at this gestational age of 22 weeks gestation. 560 grams or even 500 grams as each baby is different at birth. what does a premature baby look like at 22 weeks ?